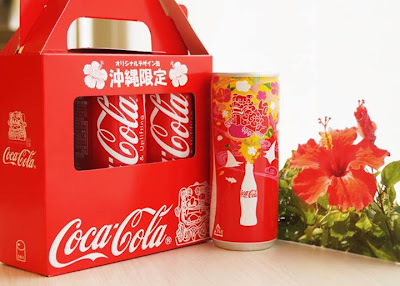 This picture is courtesy of Coca-Cola and it's not a product announcement because the contents are nothing new. This is a limited edition design for cans sold only in Okinawa. It's a limited edition, so it won't be around forever. The illustration is of hibiscus flowers and they are apparently quite popular in the region as part of gardens and parks. They are not originally from the area as the plants were brought over from China and transplanted there.